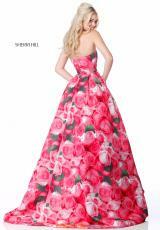 Beautiful printed ball gown dress 51792 from Sherri Hill is a fashion forward choice for your event. This fun floral gown gives you the perfect coloring and detailing for your prom, showing off your personality. A strapless neckline is supported along the fitted bodice as a figure flattering skirt flares out. For your dream dress, check out Peaches Boutique in Chicago.